Most people who are unhappy with the appearance of their teeth do not realize the numerous ways that cosmetic care can heal a smile. 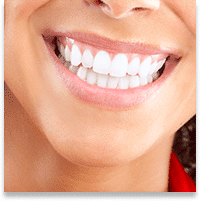 Cosmetic dentistry can correct crooked teeth, spaces between your teeth, chipped teeth, broken or missing teeth, stained or discolored teeth, and having a “gummy” smile. Dr. Cline and Dr. Hansen will create a customized treatment plan for you, based on your age, your goals, and your financial comfort level. Imagine a whiter, more brilliant smile! Placement of porcelain veneers is a conservative cosmetic treatment that makes a dramatic difference in the appearance of your teeth. If you have crooked teeth, chipped teeth, gaps in teeth or dull or stained teeth, veneers may be the perfect solution. Dr. Cline and Dr. Hansen will skillfully create a straight, brilliant smile that enhances both your appearance and your self-esteem. You can have the confidence that comes from a bright, white smile. If you are happy with the alignment and spacing of your teeth, a teeth whitening procedure may be all that separates you from a dazzling smile. Teeth whitening is safe, effective, and long lasting. Your home whitening kit involves a special tray that is customized to fit over your teeth, to evenly disperse the prescription whitening gel which is inserted into the tray before you wear it. You can expect the entire home whitening process to take between two and four weeks, leaving you with a whiter, brighter smile. With home whitening, you can reuse your trays to touch up your smile whenever it needs a little boost. If you are thinking of other cosmetic improvements, such as crowns, porcelain veneers, or replacing old discolored fillings, consider whitening your teeth first. Any future restorations will be matched to your whitened teeth, giving you fantastic results. The Zoom!™ tooth whitening system is a powerful, in-office procedure that produces fast, dramatic results. Dr. Cline or Dr. Hansen will apply a specialized gel to your teeth using a customized tray similar to a mouthpiece. The customized tray is comfortable, allowing you to hold it in place for about an hour. During that time, a specialized light source interacts with the gel to break-up even the strongest stains and discoloration. By the end of your appointment, you will have a smile that looks like it did years ago! Invisalign® begins with the use of 3D computer imaging to map out your entire treatment plan in advance, allowing you to see what your teeth will look like before you begin treatment. 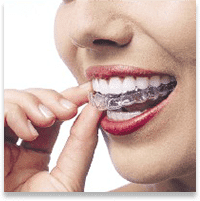 Then, using the imaging, a series of custom aligners will be created that will incrementally move your teeth. You will replace each aligner every two weeks with the next aligner in the sequence. Average treatment time from your initial teeth position to a brilliant, straight smile ranges from 9-to-15 months. And, the best part is that most people will never even notice you are undergoing treatment! If you have lost a tooth, a large gap in your smile can create significant problems for your dental health if left uncorrected. Gradually, your bite pressure may shift to other parts of your mouth to compensate for an inability to efficiently chew in the area of the missing tooth. Neighboring teeth may begin to move into the gap, resulting in discomfort, pain, and more problems in the future. After some preparation of the two neighboring teeth, crowns are created for them. A prosthetic tooth (or pontic) is fused between the crowns. Fixed bridges literally “bridge the gap” in your smile. 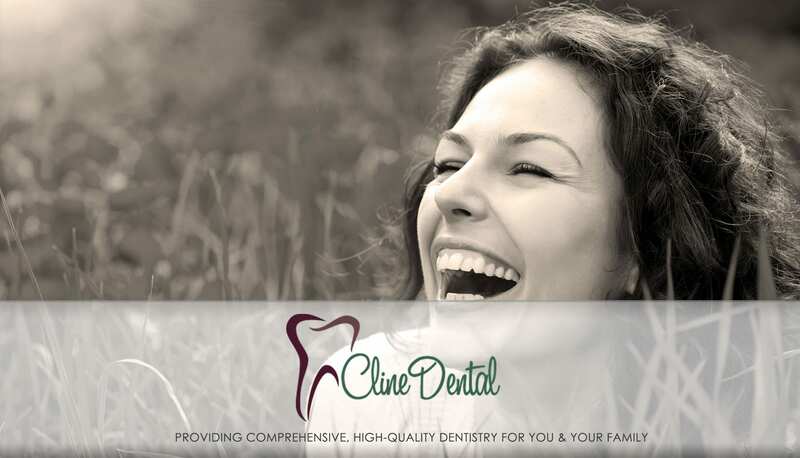 Dr. Cline and Dr. Hansen will create a functional, natural-looking bridge to correct your smile, restore your bite, and alleviate your discomfort. 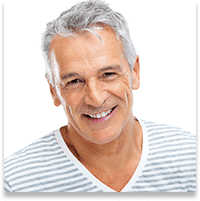 Are you embarrassed about your smile because of decayed, disfigured, or discolored teeth? If so, you may be a good candidate for composite resins, also known as tooth-colored fillings or restorations. When the decay has been removed from the tooth, it is replaced with “filling” material. In the past, amalgam (silver) fillings were placed into the cleaned-out portion of the tooth. However, with new advancements in dentistry, you can now have tooth-colored fillings instead of silver fillings, resulting in a long-lasting, brighter, whiter smile. The new tooth-colored material is bonded to the teeth for a stronger restoration.